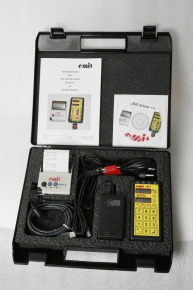 The Emit eCard system is a Norwegian System developed in conjunction with the Norwegian Sports Federations, and has been widely used now for over 17 years. It is also extensively used in Finland and Belgium, Denmark, Sweden and now UK; it is also expanding in other countries such as Spain, South Africa, Hong Kong, Japan and Thailand. Timing and result service during the event. Real time “Result displays” at location, hard copy & electronic. Internet result services, live or latent. Production and mailing of result lists. Start clocks and start displays. Ski tester equipment for cross country and ski jumping. 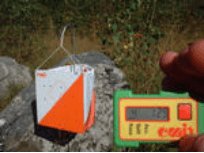 This system is developed in association with the Norwegian and Swedish orienteering federations. The definitive breakthrough came in 1995 when EPT was used in all major international orienteering events including the WOC in Germany. The Norwegian orienteering federation then decided that EPT must be used at all IOF-E. EPT consists of a start unit that resets and activates the e-card, the e-card that the runner uses to ‘punch’ at the controls, electronic controls and a reading unit that reads the information in the e-card when the runner has finished. We can offer software: for many sports, either our standard eTiming software for orienteering, road races, or cross country races, or by custom design software for larger races. World leading system with over 120.000 units sold. World’s fastest punching system. Data transfer within 1/20th of a second. Verification of punching given. Lowest cost electronic punching system. Comparable purchasing cost, but lower operating cost than others. Reset and start in one operation, not separate actions. Battery warning and power control. Robust and ‘soldier-proof’ able to stand being roughly handled and thrown into landrovers.. Proven to be reliable, especially at extreme temperatures and has built in batteries which means controls can be deployed for lengthy periods with no maintenance or charging needed. Basic system is very simple to operate and can be used without a computer or power. Display on e-cards gives fast punching and immediately split times. V6 is the latest version of emit e-card and gives many improvements to previous versions. The card now flashes for 5 secs after each punch to give positive confirmation of a punch while you compete. The earlier V3 has a display window which tells you if you visited the correct location, shows you elapsed race time and after the race you can use the display and a scroll button to step through your splits. The standard version 6 ecard has a water-resistant (back-up) card that will receive a pin mark from the conventional controls when an ecard is correctly placed into the control. These are uniquely placed (140 different locations) pins and can therefore be used to verify which controls have been visited if there is any problem with the card not registering electronically. This is a very useful tool for resolving disqualification queries and is known as the “argument solver” as it is surprising how many times competitors will visit a control, but neglect to punch, normally in the latter stages of a race when the pressure is on, fatigue is setting in and the mind wanders. If there is a pin–punch present then IOF rules allow for this to be taken as proof of a visit to the control, although it is extremely rare for someone to be able to punch a control and get a pin punch without the card registering. It is the competitors’ responsibility to ensure the card is fully inserted into the control, thereby ensuring they always get the back-up pin punch, if they elect not to do so, then they obviously cannot dispute any electronic disqualification. The newer version 6 shown here also has a small light bottom left that flashes for 5 secs when the card is placed on a control, it is also much quicker to register a punch as it uses the latest firmware. If the download team are using a computer rather than the MTR4, then there is a screen which displays a picture of the back-up card and highlights any errors, thereby making it very easy to resolve disqualifications. If not using a computer then it is recommended that any disputed card is compared to another back-up card that has been passed as correct, if necessary remove the card from the first correct runner on each course, provided they have a full set of back-up punches and label with the course details. Ecards are best held in the palm of the hand with the back-up card showing. There are several variations on how to hold the card to allow for punching and each to their own. The simplest way is to have the elastic on the ring finger of either hand (or little finger for kids with smaller mitts). On an Emit control the reader is in the hub at the back of the control and some competitors will speed punch by just brushing the card across this hub, this can be risky, but one second saved at each control can mean 20 secs saved over a standard course. Placing the card in the control will causes the light to flash on both the control and the V6 ecard and if fully inserted will also guarantees a mark on the back-up card. Each card is uniquely identified, with either a 6-digit number. Personal cards have coloured-striped elastics, The older version 3 card has an LED on the front that shows a your running time during a race and also shows the control number when placed on a control, very useful for checking when putting out controls for an event. The LED scrolls for 10 secs when a punch is made and shows the card number when the red button is pressed. After a race you can scroll through your splits with the red button. These cards are no longer produced as they clash with the new touch-free technology, but as they are very popular for use with conventional controls EMIT-UK does offer a battery replacement service, they are perfect for use in score events as the clock is very visible showing elapsed time. EMIT-UK can offer a battery replacement service on version 2 cards, but it is not recommended as the later cards are much faster to register. This simple card reader can read any ecard and produces a full splits print for the latest race, or even a full card dump showing the last 50 reads by a card. The MTR4 has a built-in battery whilst the accompanying printer has a rechargeable battery. The system is very robust and can be operated directly from within the carry case, making it extremely portable. Also based on the EMIT ET4 matching clock is the Emit timer ET5, the ultimate tool for team managers /leaders and race organizers. ET5 provides you with ski testing, matching and finish clock with printout. Online Entries System EMIT UK has investigated providing an online entry system and we have recently acquired the capability to offer this either through EQtiming which is a Norwegian based system used extensively in Scandinavia, or we offer an alternative entry system through Chronotrack our new RFID based timing system which was developed in the USA. This will allow those using EMIT to direct entrants to a website where they will be able to make their entries online, paying as necessary by credit card. EMIT-UK pride themselves on being able to time virtually any race, whatever the format.